Now we all know how the currency system is changing, your thoughts may be drifting to what you’ll be doing in the weeks leading up to the Expansion. With nine L80’s in the Family (at present) I’m well aware that the time has come to pick my starting team: there’s no way I’ll be able to level everyone immediately (though I do intend to push professions with everyone that has one, regardless of their progress to 85). The currency changes should make the choice of who goes first a fair bit easier: Hunter and Lock are pretty much geared as far as they will reasonably go (the odd PuG drop aside) and are beginning as a result to accumulate emblems that would only be used for buying saronite or gems. The question then becomes how much the 580 Emblems I have on P and the 200 on W will buy me come the announcement of Justice Points rewards in Cataclysm. 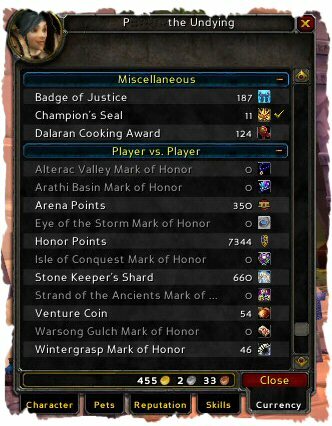 Is it worth spending the next couple of weeks running Heroics/Raid Instances to boost those totals, even if it ends up being just for a couple of items? That means (I would surmise) that we’ll get Justice Points from Heroic five mans, and Valor Points from raiding… As I won’t see a Heroic for a while and the possibility of decent Heroic-level gear fast come 85 to facilitate easier raiding is a big lure, I’d say that I’d be wise therefore to save my Justice Points on the potential raiders and spend them on the non-raiders pre-Cataclysm to help me level faster. Whether I actively stockpile Emblems prior to the switchover would largely depend on whether we get to see the gear in question before it all kicks off… but even without that I’m aware of how much stats have changed via the Wonders of Datamining (TM) As of now I am leaning towards at least some badge farming on the raiders before 4.0.1 hits. The killer could be in the short term how much Justice Points the current Frost and Triumph gears go for. We know Blizzard will convert the current Emblems at a 1:1 ratio (which would make killing a boss in a heroic worth one Justice Point, which seems a bit odd but does at least preserve the worth of the existing Emblems) it will then come down to whether the T10 chest continues to cost 90 Justice Points or not. If it does, then I think there might be a lot of second tier Heroic Farming… ^^ 4000 points (I would wager) is only likely to buy you two small items (wrists, cloak, ring) or one large item (belt, neck, offhand) come Cataclysm anyway, because if it were big things like chests or legs that would cause a gear imbalance and an advantage to anyone who was able to grind 4000 Emblems/4000 Points before the cap was put in place. On that front I find myself thinking that Blizzard may well raise the 4000 hard cap at Expansion anyway… but it’s all speculation until we here what’s worth what. Whatever happens, things are likely to get very interesting in the coming weeks. Is it 4.0.1 yet?? ?